Here is the third instalment in the ‘Decade’ themed album cover quizzes. We’ve aced the Eighties, and nuked the Naughties… Now it’s time to swing into the Sixties. 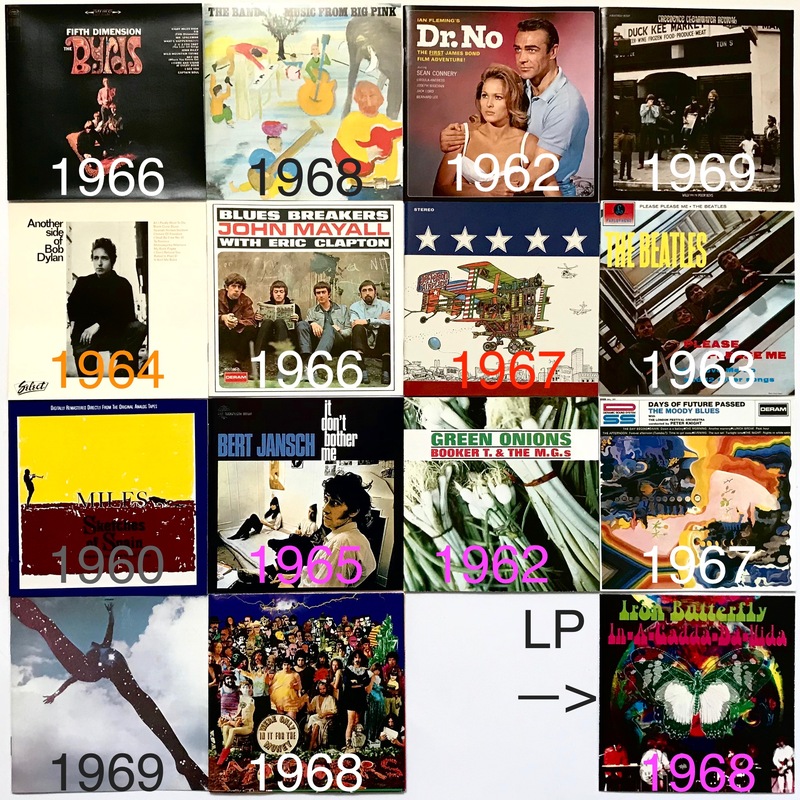 All were released between 1960 and 1969. Please don’t submit answers, simply record your score out of 15 in the Comments. Memories can now be jogged. Scroll down for answers. I predict an outpouring of dismay and forehead slapping when the results appear, JDB! My favourite number . 11. I call foul though as I see neither Whipped Cream or Delight. No Herbs I’m afraid, neither with Peaches nor Albert. I thought there was lots.of herb back in the 60’s. Whipped Cream…I loved that album! That and S.R.O. had a lot of play time on my parents’ turntable back in the day…wow, memories. When I got back into vinyl in a big way, Whipped Cream and Other Delights was the very first album I saw at the thrift store. I loved the cover and had to buy it. Then I found out it is the unofficial album every vinyl collector must own. Yesterday I was vinyl shopping and found a virtually unplayed copy with jacket in opened shrink. For $1 I took it home. Hence the comments on here. I’m a big fan of this series Bruce – and it was fun to see some covers that I actually have in the collection! Somewhere between 6 & 7 – depending on half marks for knowing artist but not album (and vice versa)! Perfectly reasonable scoring protocol, Geoff. I wonder if you browsed ‘The Book’ and came back tomorrow, whether you might crack the 7 ½ barrier! Integers now available. Scroll down for answers. 10. A couple more I feel like I’m on the cusp of. Why not have a cuspa Tea and another crack, G? We have seven small girls over for a slumber birthday party tonight… no time for a peaceful quiz. Kind of a hen party, but with young chicks. Lots if clucking. Cusps nudged. Scroll down for answers. I’ll say about 11 or 12. The “bra cover” in the upper right is a total mystery to me. Would it help if I told you it is a swimsuit top? I feel pretty good saying 13, I had to count twice though. Looks like a heyday into vinyl grooves. I see Jefferson Airplane with ” After Bathing at Baxter’s” on top. An outstanding album of true brilliance and a band’s ability to evolve with the radical times that were “a – changin”. Memories can now be refreshed… Scroll down for answers. I count 9… though not familiar with the content of all 9, I’d recognise those album covers anywhere! Indeed there are, Bruce… indeed there are. 13. How could you not recognise the beautiful Ursula Andress? Ursula invites you to view the complete set. Hmm… maybe one? Ok, nope. Another zero for me. Scroll down for a perfect score. Thanks for playing Steve. I imagine many will have an ‘Oh, Yeah.’ experience when the results are posted. Oh dear. |One, I think. But then I was 7 when we left the Sixties behind. So I wasn’t really there, man. I appreciate that’s no form of excuse. Never mind, Andrew. The decade is hugely overrated. All that brilliant music, social change, wild clothing, optimism. Rubbish, really. With some research, 10/15. Generally, I recognised the artist but couldn’t name the album. Still a couple bugging me, but they’re probably false memories. A very creditable score, PB. All bugs revealed soon. Sideburns Guy is one of the trickier ones. Something of a VC hero, but not widely known outside his genre or instrument club. I’m absolutely delighted that Ms Andress is causing consternation. My best score so far, sideburns guy no problem and beachwear girl kind of jumping out at me (it’s an age thing). Reckon I got all 15. Ah well, back to the factory. Outstanding Paul. Even the slightly sneaky silhouette guy didn’t phase you. Well done indeed. Bet you’ll kick yourself when I put up the list tomorrow! On one of my recent takes,(like yesterday) I think there might be a connection. Ursula Andress? I know Jack Palance cut an album but not in his underwear. Familiar with a few of those Bruce, you sneaky devil. Hope you enjoyed the quiz. We certainly had a range of marks, from a perfect circle to a perfect score. About half the respondents reported between 9 and 13 answers. Well done, and thanks to everyone who participated. As dismal as anticipated. The only one for which I knew *both* the artist and title was John Mayall with EC; I recognized The Byrds, The Beatles, and Zappa, but was uncertain of the titles. I spent a while googling Yardbirds covers, but didn’t get the Bluesbreaker one even though I was on the right track. Late to this but I got 8. Might have been 9 if I’d pondered the Dylan for longer. I knew it was him but couldn’t think which album. Less nights staying up late drinking and partying and more time with the books; THAT’s what you can do, young man! Hee, hee, hee. What a great idea for a quiz! I used to own nine of these albums, but I put the wrong title to the Bob Dylan cover (argh!). I recognised the ”sideburns guy” as being a member of Pentangle, but didn’t know the album. I’m glad ”After Bathing at Baxters” was shown so prominently as I almost played that album to death as the sixties turned into the seventies. I recognised the Moody Blues cover but just couldn’t remember either the artist or title (is that possible?). I hated ”Sketches of Spain” in the sixties (my flatmate played it constantly) but it took me 30 years to realize its greatness… Aaah—tempus fugit. I’m delighted you enjoyed the quiz, rockdoc, and I enjoyed your reminisce greatly.